Parking is available in the Locust St. parking garage. 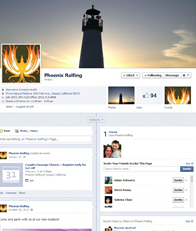 New clients are welcome to schedule a free 20-minute consultation with Phoenix. Gift Certificates are available, they can be picked up directly from Phoenix, mailed, or emailed. When scheduling an appointment with Phoenix, you agree to honor the 24-hour cancellation policy. Barring an emergency, sessions that are missed or cancelled within 24 hours of the scheduled appointment time will be billed at the cost of the session.